We had loads of fun with our swinging trio. We were billed one time as musicians and in small print it said, "They also sing". The Boz whose voice could make us lie on the levy, turn black as coal, and our hearts won’t be heavy ’cause we got CBoz in our soul – Oh Lord! CBoz is music. She fits the metaphor completely. After a bout of polio left her legs partially paralyzed her mother used music as therapy. Giving CBoz a half-sized cello (an instrument she could play seated) she began lessons at age 4. Her talents came to the fore quickly and she soon performed with MBoz on the piano, at the Philharmonic as a featured artist and as a soloist in local programs including the passion play Veronica’s Veil staged at the French Opera House. Like her sisters, CBoz studied music with Professor Otto Finck and became proficient on the piano at an early age. But it was New Orleans. It was the beginning of the jazz age. And the Bach fugues soon gave way to ragtime and CBoz learned to play the saxophone (which she played in a “barrelhouse style”). But neither she nor her sisters ever took voice lessons. They listened to their parents sing barbershop-style with their aunt and uncle, and began harmonizing along the way. CBoz recalled her greatest musical influences were Enrico Caruso (she marveled at his breathing and the way it allowed him to hold notes) and Mamie Smith, an African American blues singer. A lot of Mamie and a little bit of Bessie Smith can he heard in CBoz’s first recorded solo, Cryin’ Blues. How wonderfully strange it must have been in 1925 to see this tiny, young, middle class white girl belting and growling through a song of unrequited love. But it became a hit record in the south and paved the way for a great singing career. As a soloist, CBoz was one of the first to truly appreciate what a microphone could do for a singer. Although capable of projecting her voice to be heard unmiked into the rafters of the largest auditorium, she sang soft and low into the microphone, creating an intimacy that singers would imitate forever after. 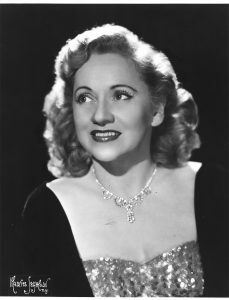 Unlike most of her contemporaries, she sang in a style closer to her speaking voice the than falsetto favored by European singers. She borrowed liberally from African-American, Latin, jazz and folk idioms and rolled it up into a style that generations of musicians would follow. Her pitch was low and range not wide, but the beauty of her voice, the preciseness of her diction, and flawless phrasing set the standard for popular singing. Irving Berlin preferred her interpretations of his songs above all others and Ella Fitzgerald has always credited her with being the one person who influenced her. Although her style changed over time, and years in smoky nightclubs quickened her vibrato and made her voice huskier, she remained one of the greatest voices in America until the end. CBoz is generally credited with being the primary arranger of the Boswell Sister’s music. While there is no doubt that CBoz wrote the charts, the Sisters worked out the harmonies as a unit. She told a reporter that she and her sisters would work out an arrangement by having Martha play the music through once as it was written. Then they would begin working on the harmonies at the end of the song and work their way to the beginning. She also provided a great musical foil for Bing Crosby, and their friendly, intimate banter helped them launch a series of hits in the 30s and 40s. Another trend born of the mind of CBoz was swinging the classics. She took the English lyrics to Von Flotow’s “M’appari tutt’amor” and turned it into the jazz classic, Martha. She later gave Ah, Sweet Mystery of Life a bounce. There were also several songs written by CBoz and under her nom de plume Diana Foore. She performed most of them, including Never Had A Lesson in My Life, Lummir Alla Zingen, Main Street on Saturday Night, You Ain’t Got Nothin’, and I Don’t Mind. Active on stage and radio since 1922, Connie would record, make movies, appear on Broadway and tour across the globe for the next 40 years. She even starred in the TV series Pete Kelly’s Blues in 1959. When you add the Boswell Sisters and CBoz’s recordings together they cut over 300 sides and sold over 75 million records. CBoz has been described as tiny, intense and brilliant. She loved to talk. She told an interviewer that sometimes when she was on the road she’d be asked to make an appearance at a TV or radio station. But then they might tell her they didn’t have a script and needed 30 minutes worth of interview. She laughed and said for her that was as easy as falling off a log. Her sister Vet described her as “silly.” She loved to play pranks and the trio was known to terrorize their neighbors with practical jokes. She also loved sports and could often be found out for a football or baseball game. Songwriter Jack Lawrence described CBoz as “Always smiling.” Kay Starr recalled her compassion and her willingness to give her time to help those whose handicaps had left them despondent. She loved to exercise, ride her bike and became very physically fit. She could party with the best of them and could hold her own with Mae West or Dean Martin. She was also a dedicated Democrat and loved to talk politics.